I packed up my bits and said my goodbyes to Walter who had so kindly housed me in gorgeous downtown Vienna. It was starting to get dark by the time we arrived to Klagenfurt by train. It was decided that we would explore town directly from the train station. Which meant that I would be carrying all of my luggage with me for the walk. 3 hours from Vienna to Klagenfurt. Thankfully, I didn’t have much. “Well, you passed that test easily.” Alpagu said with an air of shock to his voice. Long ago I had learned my packing lesson during a trip to Paris. Less is more. You really don’t want to leave your stuff anywhere, and when you pack light – you don’t have to. I learned that we would be quite serious about this on our upcoming guided tour. We would taking a vehicle and driving across the EU – so space was limited. I had only one small backpack and my purse, Alpagu had about the same. 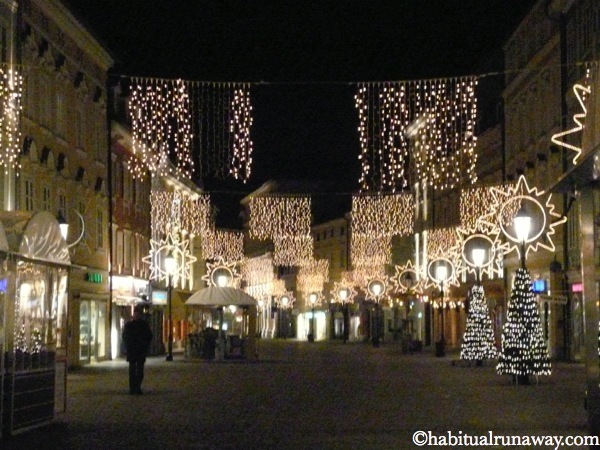 Klagenfurt has just under 100,000 residents and is the capital of the federal state of Carinthia. It sits by lake Wörthersee and is on the Glan river. The city’s name means “ford of lament” or “ford of complaints”. It could also mean ‘a place at or in the water’, depending on which source you credit or when you believe Klagenfurt was given its handle. There is quite a controversy about the history, actually. Pope Pius II claimed that the city was named ‘ford of lament’ after a miscarriage of justice involving a young boy who was executed after being falsely accused of theft. Now, since 2007, Klagenfurt officially goes by “Klagenfurt am Worthersee” (Klagenfurt on Lake Worth). We walked from the train station to the newly ‘modernized’ (read as ‘less cobblestone, larger roadways’) downtown. Town centre was lit up beautifully for Christmas. The fragrance of mulled wine (gluhwein/gluewein) floated across my path, certainly emanating from one of the multiple outdoor heated bars (pictured above) that I mentioned earlier. Klagenfurt is not without it’s history. During WWII, the nearby plains of Viktring, hosted a bloody battle in June of 1945. At that time, the British Command delivered to Tito (a Yugoslav revolutionary) for slaughter, approximately 12,000 anti-Communist fighters called Domobranci (Slovenian Home Guards) . Klagenfurt to this day identifies as being highly anti-communist, even though they have some neighbours who figure they would be happy enough to return to their place behind the iron curtain. The Trinity Plague Column pictured above, was originally made of wood. It was erected on Heiligengeistplatz square in 1680 to commemorate the lives of plague victims. 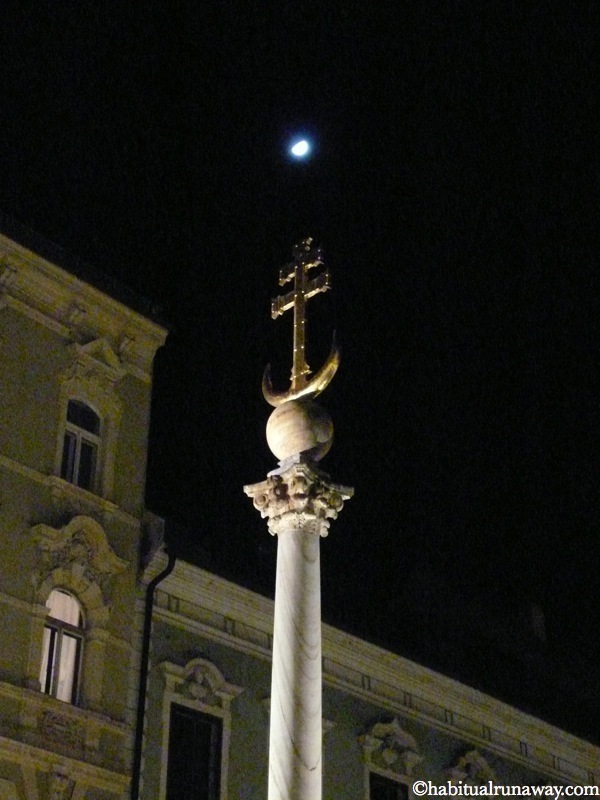 After victory over the Turks (Vienna 1683), a half-moon and cross were added. In 1965 the monument was relocated to Alter Platz square. We wandered for a few hours (thank goodness I wasn’t carrying much), enjoying the sights, before I was shown my temporary home in one of Klagenfurt’s old communist bloc buildings. Communist bloc housing, locally known as ‘panelak’ (or panel houses), is quite ‘popular’ in many countries that were formerly a part of the Soviet Union. This type of structure can be found all around – in neighbouring Slovenia, Slovakia, Czech Republic, Germany, Poland – even in Mongolia. 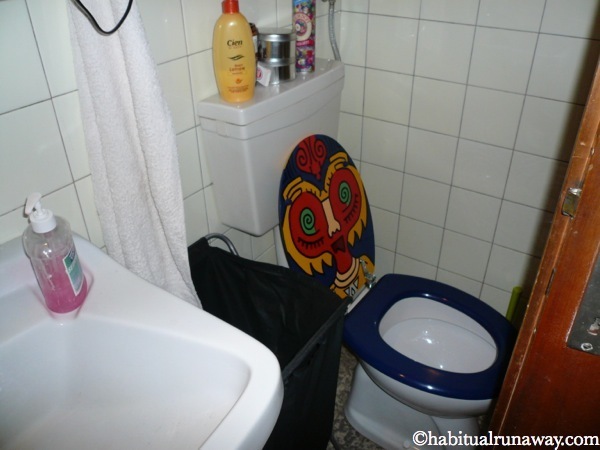 According to Wikipedia, one third of the population of the Czech Republic lives in a panelak. My panelak was made for one, single person. Literally MADE for one. With no bedroom, we would call it a (small) bachelor apartment here in Canada. The water was rationed for one person and refilled once a day at 2am. Alpagu warned me that I would need to be less North American with my usage if I was going to ‘make it’ 24hrs. He showed me the tub. In order to bathe, and drink, and clean dishes with the small amount of water rationed, you couldn’t take a shower or a bath. 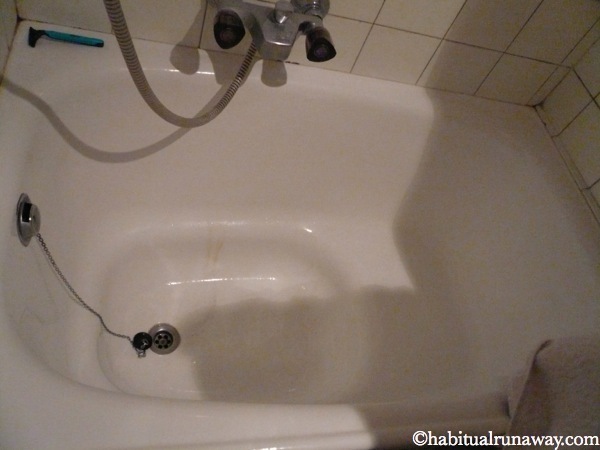 Instead you were to fill the lower, shallow basin of the tub with water (pictured above, right), sit on the seat and clean by soaping up and sloshing the rationed water on yourself. If I had taken my usual 20/30 min shower, I would have burned through the daily resources of at least three single units. 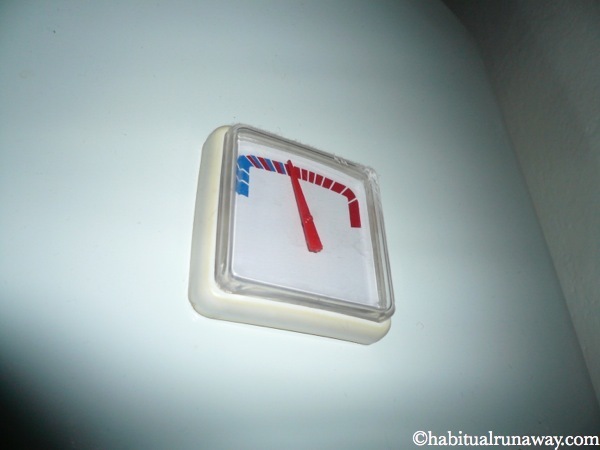 Regularly throughout the day, I would check the water meter (above) to see what I had left. I did manage to run out of water more than once while staying in the penelak (also known as a gemeindebau in Austria). 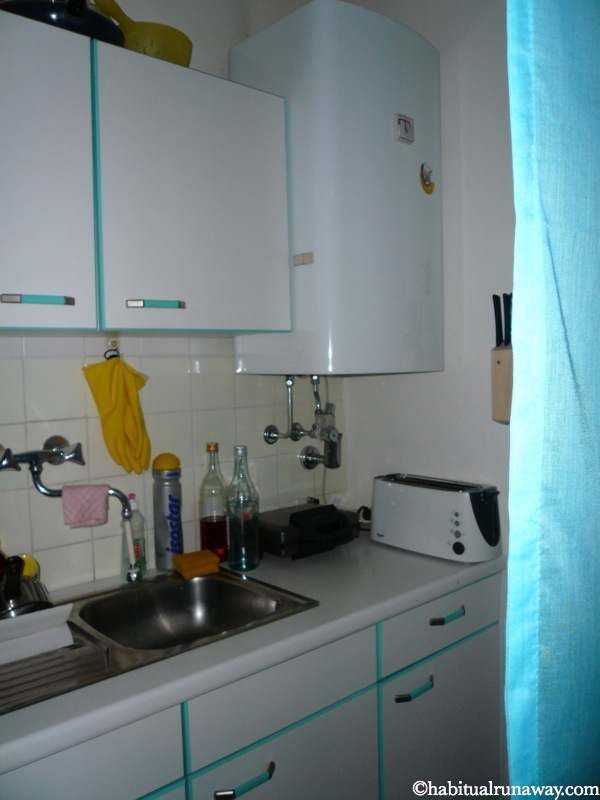 Pictured below is the galley style kitchen in the teeny apartment. The water tank (with the days ration) is clearly visible on the right. I had barely entered the apartment and taken my coat off when Alpagu asked me if I had ever been to Italy or Slovenia. I answered no to both. Without taking a breather we got right to work planning the upcoming tour. Picking routes and sites and monuments. Looking into group accommodations, mapping and going over timing. It was exhausting and stressful. Daylight was breaking before I even got up for my first bathroom run. I was delirious from lack of sleep and too much brain work. 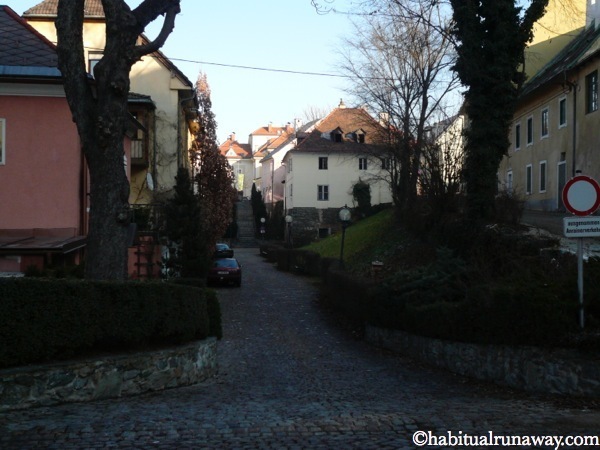 A quick pic of some lovely cobblestone lane way as we raced to the Train Station. So up I got. I readied as quickly as I could (not fast enough for Alpagu! ), and in about 22 minutes we were out the door walking briskly to the train station, on just the other side of the downtown. Ljubljana, Slovenia – here I come! Additional photos in the slideshow. 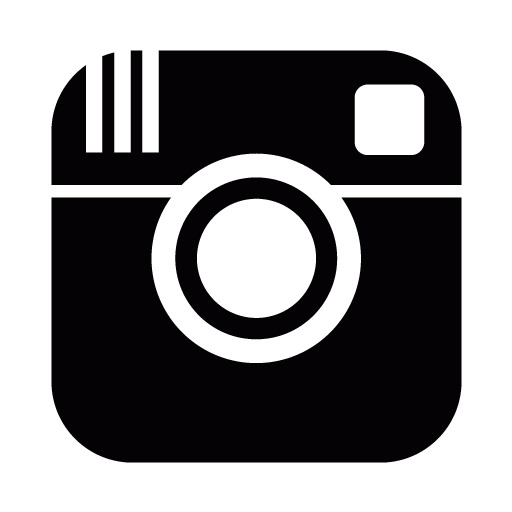 Click any photo above to view photos in a larger format. Head to the Habitual Runaway on Facebook for the full Austrian photo experience, or follow this tour by going to the ‘Winter in Europe‘ section. I have no tolerance for sleep deprivation while at home – but for some reason I can manage on 3 or 4 hours while travelling. It is like I spin excitedly out of control when in a foreign/unfamiliar place & my adrenaline is constantly working to keep me awake. I am a bit out of my mind, really…!! Klagenfurt was interesting – cool to see how average Austrians live & the Glan is quite beautiful. You have really been around!! Not many people have heard of Klagenfurt! I love the photo of the trinity plague column and how it appears perfectly in line with the moon above. Thank you – that was what compelled me to take the photo actually – lovely natural juxtaposition :). I am one who conserves water … or so I think! I’m sure I would have run out several times, too!! I thought I was an under user as well – it just wasn’t much water – barely enough to clean & cook with. A great learning experience though! I’m feeling weary just reading this, but can’t wait for the next instalment. How exciting. Oh yes – it is all very epic (and tiring!) – taking me a few days to put together the next instalment actually!